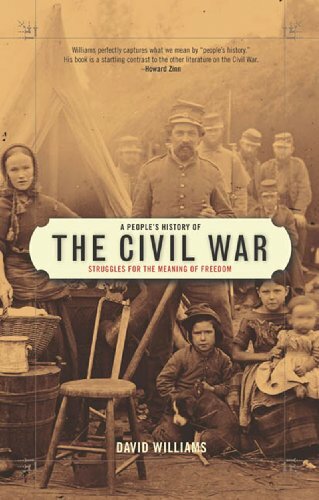 This book is about the people and their lives during The Civil War. It refers to Lincoln, Jefferson Davis, Sherman, Grant, but the story it mainly tells is about the common folks: the yeoman farmers, free blacks and slaves, Confederate soldiers, Union soldiers, wives, sons, daughters, and parents caught in the middle of the conflict. I find that the majority of the book discusses the class conflicts between rich and poor. The rich could either buy their way out of the draft or hire a substitute. This was especially true of the Confederate planter classes and the “20 slave rule” that exempted men if they owned 20 or more slaves. The planter classes needed the working classes to keep the black population under control. Once the Confederacy instituted the draft, this caused the working classes to realize that the slaves needed to work the fields were more “valuable” than they were even though the were white. This lead to classist problems and then to armed conflicts between the rich and poor in parts of the Confederacy. Women, usually white middle class women, but also black women and poor, working class white women, had to deal with class conflicts as well as sexual discrimination. “Except for interactions with male servants or slaves and those of a lower class, white women were restricted by custom and law to subordinate status in nearly all their contacts with men.(131-32). Women had to keep the home together, deal with farms and/or businesses and care for the children while the men were off at war. During the war, women served as nurses, spies, teachers and government clerks. There were even several hundred women that donned men’s uniforms and took male names in order to fight in the war. DeAnne Blanton and Lauren Cook authors of They Fought like Demons: Women Soldiers in the American Civil War document the existence of about 250 women that fought on both sides. Other women were forced into prostitution. The more mobile women became “camp followers” , others trying to remain somewhat respectable said they were “widows in need of aid.” Most women were forced into prostitution having no other means to support themselves and/or their children. The majority of men that fought in the war were working class or lower class men. Most of the men felt they were just cogs in a war making machine. These attitudes weren’t helped by malnutrition, poor medical care, lack of clothing, lack of sanitation and clean drinking water, and the worst of the worst: The Civil War prison. “Neither side gave much thought to providing adequate housing, food or clothing for prisoners.”(237). Early on prisoners were exchanged, but after blacks were inducted in January 1863, Confederate policy was to treat blacks as rebellious chattel and their white officers were viewed as leaders of slave insurrection. These horrible conditions while in the military or in prison, along with receiving letters of family members suffering lead many men to desert. Most slipped away either in groups or individually or went home on sick leave never to return. When drafts were instituted, class antagonism, dissent and violence went hand and hand. Thousands of enraged Northerners rioted during the Summer of 1863. The most infamous and most violent of these is the Draft Riots of New York City on July 13, 1863. ( See Martin Scorsese’s Gangs of New York.) This riot was so all encompassing that soldiers returning from the Battle of Gettysburg had to be call in to quell the violence. In the Union, especially the border states, the writ of habeas corpus was suspended and men were hauled off to jail to languish for months. Anti-Lincoln administration or anti-war newspapers were suspended or denied usage of the postal service. Men recognized today as “conscientious objectors” in Quaker, Mennonite, Shaker and Dunker/Dunkard sects found that military service conflicted with their religious principles. “In August 1863, Colonel Joseph Holt, judge advocate general of the army, made clear that, ‘persons having conscientious scruples in regard to bearing arms are not on that account exempt. The Society of Friends, and others entertaining similar sentiments, if drafted, may find relief from their scruples in the employment of a substitute, or in payment of the $300.00’ “(261). Congress later stated that these men could be assigned non-combatant roles, hospital duty, care for freedmen or pay the $300.00 fee. Some ignored the draft by simply not showing up to report for duty, some fled west since only residents of states not territories were subject, and some 90,000 men fled to Canada. Others self-mutilated, some had teeth pulled since a soldier had to have enough teeth to bite off the end of a cartridge, some pretended deafness, blindness, and lameness. Some had false medical exemptions drawn by doctors or made up by lawyers. While the anti-war sentiment in the North slowed down victory, in the Confederacy anti-war sentiment or actions directly contributed to its downfall. “Though most southern whites were hardly outright unionists, it was ‘a certain fact’ as one Georgian wrote in a letter to Governor Brown, ‘that the Southern people are fast becoming as bitterly divided against each other as the Southern and Northern people ever has been.’ “(284). Like Lincoln, Jefferson Davis identified dissenters, suspended habeus corpus and declared martial law. However, unlike the Union, the Confederacy “exempted” certain professions and those became the most sought after and the most corrupt. Conscientious objectors in the South also refused military service, like their Northern brethren. Resistance by these men so persistent and troublesome that the Confederate Congress finally exempted them from the draft June 1864. The book also talks about Native American response and in some case resistance to the war. However, the treatment of Native Americans during this time period is so bloody and brutal, that I couldn’t read through it.